Love is a sandwich made by a husband and carefully wrapped in brown paper and sealed with a sticker, just like the shop does it, and left in the fridge so there is something good for lunchtime. Back from a check up which requires a 24 hour fast and more, I've been pottering round here getting my appetite back. To tempt me, he made me a sandwich, just like my favourite from the best sandwich shop in town. I'd eaten half of it by 11am.. I haven't had much of a chance to make anything in the last few days, but there is somewhere you can find something new from me today. A while back, Bernice from Newly Creative got in touch to ask if she could interview me for a series she has been running on Fridays. It's my turn today and you can find it here. Thanks Bernice! Love is ... Love wrapped up with a sticker I love it. Love is three barrow loads of wood at the back door to keep me warm while he takes the children away to the snow for the weekend. I will miss them, but I will be warm. love is out doing secret shopping as it's my birthday tomorrow! 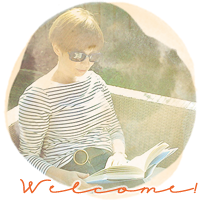 What a great interview over on Bernice's blog. Really enjoyed it. How thoughtful a husband who uses a sticker on a sandwich wrap. Wishing you well. And the love that motivated the sandwich probably made it taste better than the shop version too! awww. What a sweetie. This made me smile. I love your interview too. Your sandwich looks good. And you are right---love is little things! I also enjoyed your interview. I have been creating since I was a little girl too. I started with pasting things I cut from magazines in to Reader Digest magazines. It reminded me of those green stamp books my mom had. She was creative too. Love is, most definitely, in the little things. 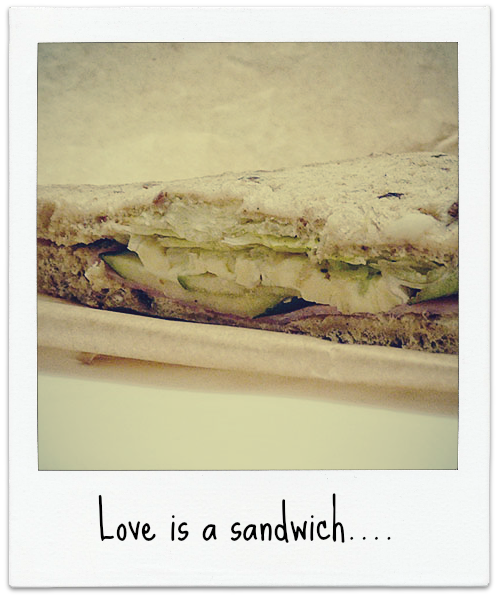 You had me at "love is a sandwich." Sweet post today, Sian, now I'm off to read your interview. That definitely is love - what a sweet gesture! Hope your appetite returns full force & you can enjoy the other half! A sandwich made by someone else always tastes so much better! I agree that it has to be in the fridge and served cold. This post has me wanting to take a trip to my favourite sandwich shop for a thick egg salad sandwich. That's really sweet. I used to put notes in my husband's packlunch box but we found it embarrassing! Ahhhhhhhh ...off to read the interview. Oh yes. Mine was when Craig trekked into town for a cheese & onuionpasty while I was sitting for a further 2 hours in the hospital waiting room after my 10hr fast for that blimming glucose test. Who needs flowers eh? That definitely is a awwww, you did that for me? moment. That certainly is love :-) it's the little things. Hope you feel better and the check ups come back fine. Loved the interview, I hadn't heard that quote in so long, my roomie at uni studied Maya Angelou and Toni Morrison for her dissertation so I heard a lot about it then. your sandwich looks delicious! such a thoughtful act means you are much loved. hope all is well and that your checkup was good. That's exactly how I feel about my morning cup of coffee! And it reminds me of when I was recovering from some awful respiratory thing back in grad school. I hadn't eaten much and had no appetite . . . until Paul made me some fantastic spanakopita. It's amazing how food can be such an indicator of love. oh he is most definitely a "keeper" :) I had a procedure done Friday that required one day of soft foods, one day of liquids then 12 hours of fasting. The Chosen One spent all of Friday afternoon offering me various foods that offered no appeal. When he placed Outback takeout in front of me the appetite returned lol Hope you get good results! Oh how sweet. It's so nice when there is such a caring surprise like that. I hope all went well with the appt.